95% of respondents find online ratings and reviews “somewhat” to “very” reliable. Of that group, 100% between the ages of 18-24 find online ratings and reviews “somewhat” to “very” reliable. 97% of respondents between the ages of 25-34 report the same sentiment: “somewhat” to “very” reliable. 70% say online ratings and review sites have influenced their decision when selecting a physician. When referred by another doctor, 41% of consumers still check online ratings and reviews of doctors/specialists. 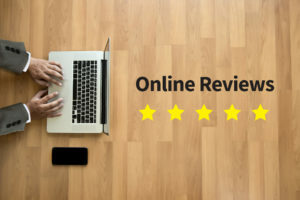 Effective reputation management requires that you monitor − and participate in − online conversations about your healthcare organization on the most popular rating and review sites. Step one is to get familiar with and get control of your listings on the most popular review sites. Learn how to create and update listings, and how to claim listings that may already exist. And, learn the rules for posting responses to reviews. It’s important to respond with the right tone to reviews, whether they’re positive, negative or in between. Positive – Thank the reviewer for their kind words and their visit; be specific, without revealing personal details or private health information. Invite the patient to tell others about their experience, and for SEO’s sake, mention your business name and location. Negative – Even if the comments are unfounded, keep your response brief, non-confrontational and sympathetic. Apologize for the upset caused, and offer to make things right. Invite the reviewer to contact a staffer by name, to take the matter offline. This is a place to leave out your business name and location. Neutral – Lukewarm reviews should get a warm response, so treat a “meh” review as a one-star complaint. A detailed and sympathetic response shows you appreciate this patient, and everyone who might be reading reviews as part of their decision to call your facility. What about false, inaccurate or inappropriate reviews? Learn the ins and outs of review site guidelines, or you could find yourself at a disadvantage. For example, do you know the policies of important review sites on disputing or removing a review? There’s lots more, of course, because each site that accepts reviews has slightly different standards and practices for responding, disputing or removal. If your responsibilities include reputation management, it’s best to gather all the different details in on spot, so you can set and act on policy, instead of wasting time on repetitive research.